How Did All of These Colleges Get My Name? Each year, thousands of high school juniors and seniors (even some sophomores) are surprised when college recruitment literature begins to arrive at their homes. A barrage of information comes from all directions including “snail mail,” email, and text messages. This leaves many students wondering just how all of these schools managed to acquire their contact information in the first place. Colleges acquire names from a number of sources including the Educational Testing Service (ETS), the National Research Center for College & University Admissions™ (NRCCUA®), the American College Testing Program (ACT) and a variety of other sources. You may recall that when you sat for the PLAN, PSAT, ACT or SAT exam, you completed a section that included information about yourself -- your academic interests, your address, your high school grade point average, etc. You also answered a question about whether or not this information could be shared with interested colleges and universities. If you responded in the affirmative, these businesses made your information available. So, I'll get a lot of mail? Many high school students find the amount of mail they receive to be staggering. This is particularly true for those students who have both high scores on standardized tests and impressive grade point averages. One suggestion is to create three piles or boxes of varying priority: plan to apply, good possibility, would like to investigate further. Organization is always a plus in this process. Do colleges send mail to all test takers? With more than a million high school students seeking admission to college each year, it is impossible for a college to reach out to ALL prospective students. Instead, colleges target only those potential applicants who appear to be academically qualified to gain admission. Individual schools often narrow down their recipients based upon a minimum score on the PLAN, PSAT, ACT or SAT exams, a minimum grade point average, residence in a specified geographic area or interest in a specific field of study. Does it mean anything when colleges send me admission materials? Mailing materials to prospective students is expensive and time-consuming. As a result, colleges only reach out to those students who look like they might be interested and qualified. A mailing from a college is your first indication that the school is interested in starting a conversation with you about the possibility of applying for admission. Of course, while receiving these materials indicates you might be a good match, it in no way guarantees that you’ll actually gain admission. 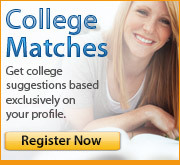 Therefore, it’s best to consider mailings a great jumping off point for your college search and no more. Do colleges expect a response? Universities recognize that many of the students they contact will have little or no interest in attending their institutions. As a result, most colleges request/expect a response only if there’s a desire to receive additional information and further the conversation. If you receive materials from a school in which you are genuinely interested, don’t be shy about making direct contact with them. You can reach out via phone, in writing or by visiting the campus. Remember – colleges love finding interested candidates. They’ll be more than happy to answer your questions or send you supplementary information. And, as an added bonus, such contact shows a high level of interest – a factor that could work in your favor during the actual admission process.